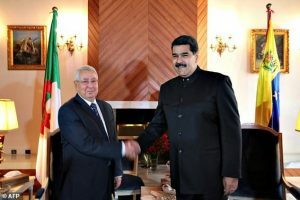 Venezuelan President left Algiers Monday without meeting with his peer Abdelaziz Bouteflika, although the meeting had been scheduled. The Algerian Presidency did not clarify why the encounter did not happen but speculations and critics point at the Algerian President’s health condition. The meeting cancellation sparked once again debates about the Algerian leader’s inability to run the North African country. President Bouteflika since suffering a mini-stroke in 2013 has been glued to a wheel-chair and has made rare public appearances. His office in February cancelled a visit by the German Chancellor Angela Merkel. The office announced that the Algerian leader was sick. In March, Iran’s President Hassan Rouhani also cancelled a trip to Algiers on similar grounds. The last time the autocratic leader was seen in public dates back to late March during a visit by Congolese President Denis Sassou-Nguesso. Debates over the President’s inability to run the country have hyped recently. The opposition has called for the implementation of the constitution’s article 102, demanding change of the President in case of inability to carry out his mandate. Last month, critics of the President urged the army to intervene but the army command said it would stick to the constitution.